Ngāti Porou, Ngāti Hine, Rongomaiwāhine. Ngahiwi Apanui is one of New Zealand’s most prolific composers of moteatea (traditional chanting) and contemporary Māori music. 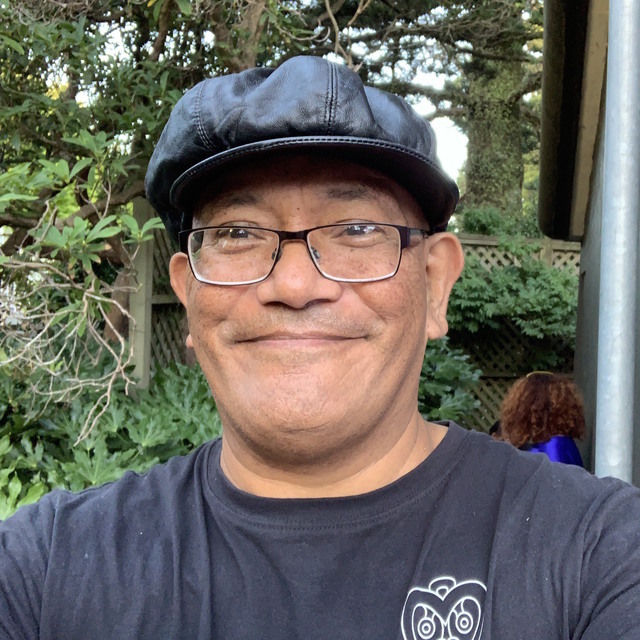 With the loving influence of his mother and wider family in Te Araroa, East Coast, Ngahiwi was brought up as a native speaker of Māori and has strong values of working hard and education. As a young student Ngahiwi was part of Kiwi music legends and kaupapa Māori band, Aotearoa. Aotearoa band shocked and delighted New Zealand in the mid to late 1980s with their hard-hitting lyrics and free flowing reggae. Aotearoa hit the headlines and NZ Music Charts in 1985 with the single Maranga Ake Ai, a call to Māori youth to rise up and take pride in their identity. With lyrics such as, “all my life I get taught by the right of the great white way, how much longer before we get up and say?”, it was little wonder that mainstream NZ recoiled in shock. The band toured extensively and featured more than 30 band members in that time including Moana Maniapoto of Moana and The Tribe, opera diva Mere Boynton, Southside of Bombay founder Kevin Hodges, Maaka McGregor of Wai, Ruia Aperahama, Joe Williams and Ngahiwi Apanui. Since Aotearoa, Ngahiwi has performed as a solo artist and collaborated with many of Aotearoa’s top Māori singers and musicians. In 2011 Ngahiwi was the APRA Silver Scroll Award finalist in the Maioha section with his composition entitled E te Kōkā and was the first Maioha recipient in 2003 for his song Wharikihia. Also in 2003 Ngahiwi won Best Mana Reo Album for E Tau Nei at the New Zealand Music Awards. Ngahiwi also wrote the Olympic song for Rio called Ana Hi in 2016. Alongside music composition Ngahiwi has been integral to the Māori music and language strategy and one in particular about the ‘Four Worlds of Māori Music’. Ngahiwi is a top advocate in education and was CEO of Massey University’s, Ako Aotearoa. Prior to that he was station manager of Radio Ngāti Porou and now is the CEO at Te Taura Whiri i te Reo Māori (Māori Language Commission). “I am a practitioner of kaupapa Māori (Māori principles/values) with experience in business, broadcasting, the arts, music and education. Vision, courage and innovation are cornerstones of this approach. I am very proud to head a committed team at Te Taura Whiri and am excited by the challenge ahead of the organisation and our new role - working with organisations and agencies to appropriately express the Māori Language strategy and promoting te reo Māori to wider Aotearoa New Zealand. Key words for us are: relevance, integrity, and excellence. The end game is to assist Aotearoa New Zealand to be a Māori speaking nation."